Our Jeep rentals are available at no less than three locations in Waikiki Beach. If you are staying in Waikiki, our central locations are found throughout Waikiki Beach. A great place to begin your day trip beyond the city. The BRAND 4 & 6 spot is just a stones throw from the International Market Place, Duke Kahanamoku Statue and Waikiki beach. Our car rental kiosk agents can direct you to hot spots like Oahu's North Shore, Pearl harbor, Diamond Head Crater, Hanauma Bay for snorkeling or just lounging on the beach. These are just a few of the things to do while in Oahu. When renting a Jeep in Waikiki, remember that our BRAND 4 & 6 (HN2) car rentals are on Seaside Ave., between Kalakaua and Kuhio in Waikiki. While the Top Brand 3 fleet location (HN6) is located at the Hyatt Regency on Kalakaua Avenue. The Top Brand 5 rental car lot (HN3) is found at the Ohana East Hotel in Waikiki. Rent a Jeep in Waikiki using our Discount Rates or read above for more details. 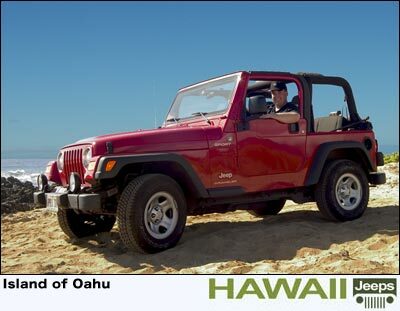 Our Jeep rental partner also offers Wrangler rentals at the Honolulu (HNL) airport on Oahu. Offering discount rates for the above agencies and locations. 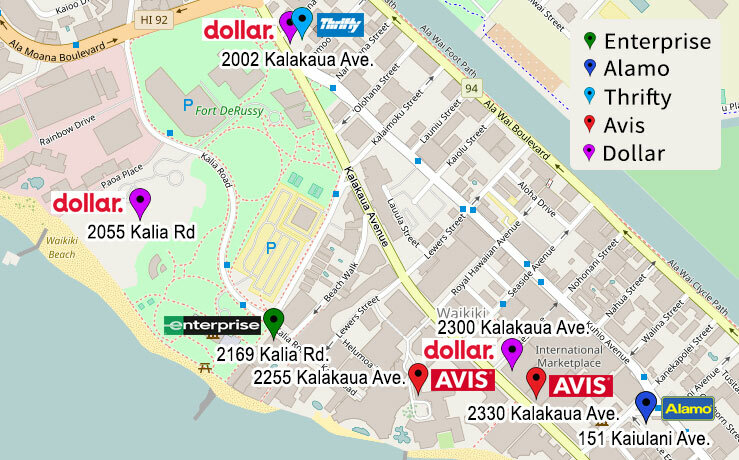 The Avis rental car lot (HN3) is found at the Ohana East Hotel in Waikiki. Thrifty and Dollar (HN2) car rentals are on Seaside Ave., between Kalakaua and Kuhio in Waikiki. 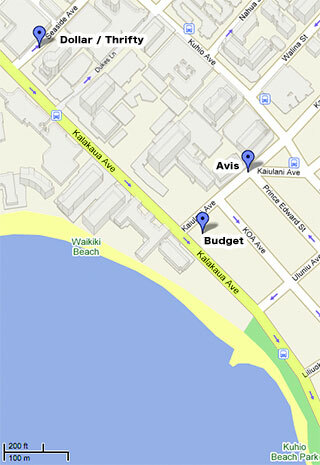 The Budget fleet location (HN6) is located at the Hyatt Regency on Kalakaua Avenue.